Grand Velas Los Cabos, the fifth property of the family owned and operated Velas Resorts opening in late 2016, announces that two star Michelin chef Chef Sidney Schutte will head up its signature Cocina de Autor restaurant. L to R: Vincent Colauto, Sidney Schutte. Grand Velas Los Cabos, the fifth property of the family owned and operated Velas Resorts opening in late 2016, announces that two star Michelin chef Chef Sidney Schutte will head up its signature Cocina de Autor restaurant. Netherlands’ rising star Vincent Colauto will be chef de cuisine. Chef Schutte’s Dutch heritage, passion for traveling and four years in Asia shaped his palate and inspires him to present different taste sensations in a single meal. Ingredients themselves are a source of creative inspiration. “My cuisine is distinctive for its outspoken flavours that pop. I create a culinary experience with multiple dishes with the finest ingredients from the best local and international purveyors, and that’s what we’ll do at Cocina de Autor,” said Schutte. Schutte gained extensive experience in prestigious kitchens throughout Europe and Asia, including those run by Dutch top chef Richard Ekkebus at Amber, a two Michelin star restaurant in Hong Kong; Roger Souvereyns, of the two Michelin-starred De Scholteshof in Belgium; and Jonnie Boer, acclaimed chef and owner of restaurant De Librije in Zwolle. With his support, De Librije earned its third coveted Michelin star. Only seven months after opening, Boer’s second outpost, Librije’s Zusje Amsterdam, was awarded with two Michelin stars under his reign. 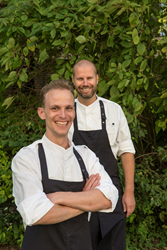 Schutte has been acknowledged as “SVH Meesterkok,” the highest recognition that a chef can achieve in The Netherlands. Colauto, who worked with Schutte at De Liberije, will oversee Cocina de Autor’s kitchen staff. He has completed training at the ROC and Spermalie in Bruges in addition to Katseveer, awarded one Michelin star. Most recently, he acted as Head Chef at Fletcher Hotel-Restaurant Duinzicht in the Netherlands. Velas Resorts’ Cocina de Autor signature restaurant was originally launched at Grand Velas Riviera Maya where it continues to be overseen by award winning culinary stars Mikel Alonso and Bruno Oteiza, disciples of uber chef Juan Maria Arzak. For reservations or additional information, please call 1-888-407-4869 or visit http://loscabos.grandvelas.com. Opening in late 2016, Grand Velas Los Cabos on Mexico’s Baja Peninsula is the fifth property of the family owned and operated Velas Resorts. Located between Cabo San Lucas and San Jose del Cabo, the $150 million beachfront property will offer the next generation of all-inclusive amenities and facilities with dramatic ocean views and unique spaces infusing every area of the resort. All 304 ocean view suites are over 1,180 sq. ft. with private terraces and personal plunge pools while duplex wellness suites have designated wellness amenities and insuite juice bars. Grand Velas Los Cabos features five gourmet restaurants with an extensive beverage program and wine based features inspired by the proximity to the region producing Mexico’s fine wines. A staff ratio of 3 to 1; 16,370 sq. ft. convention center with the capability for 20 breakout rooms; 35,000 sq. ft. Leading Spa with 20 treatment rooms and hydrotherapy facility; three pools, including one adults-only; and pool and beach concierges are available. Rounding out the list of amenities and services are a Life Fitness Center with personal trainers, exercise programs, yoga, Pilates and meditation; recreational activities program; separate teens’ and kids’ club facilities and activities program; 24-hour personalized butler concierge service; and 24-hour insuite service. A gallery of contemporary art will continue the company’s commitment to bringing the art, fashion and culture of Mexico to guests. The curved, half-moon design of the hotel will catch eyes along the corridor with an iconic grand entrance that’s open air, three stories high and over 300 ft. above sea level. All of this beachfront, just 35 minutes from the Los Cabos International Airport which directly services over 40 destinations in the United States, Canada and Latin America. Velas Resorts are operated by Eduardo Vela Ruiz, majority owner, founder and president of Velas Resorts, with brother Juan Vela by his side, vice president of Velas Resorts. For reservations or additional information, please call 1-888-407-4869 or visit http://loscabos.grandvelas.com/.